The flowers are starting to bloom, the sun is out and it almost feels like it could be spring...and then it starts to snow again. This next recipe is filled with fresh flavours, that are still comforting enough to warm you up from the cold. Herby lemon parsley pesto made with pumpkin seeds and pumpkin oil, for a unique flavour that is simply incredible and smells absolutely amazing! 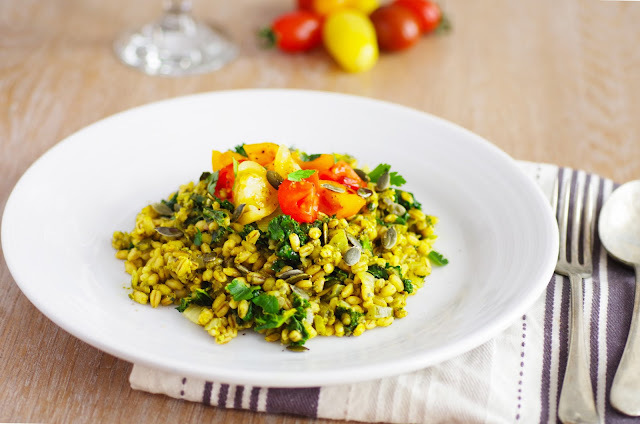 Swirled into tender pearl barley, with fresh kale and heirloom tomatoes, for that touch of sweetness. I first heard about pumpkin seed oil in Slovenia - it makes a beautiful dressing for this Green Goddess Salad, it has a unique nutty flavour that almost can't be described - you have to try it! 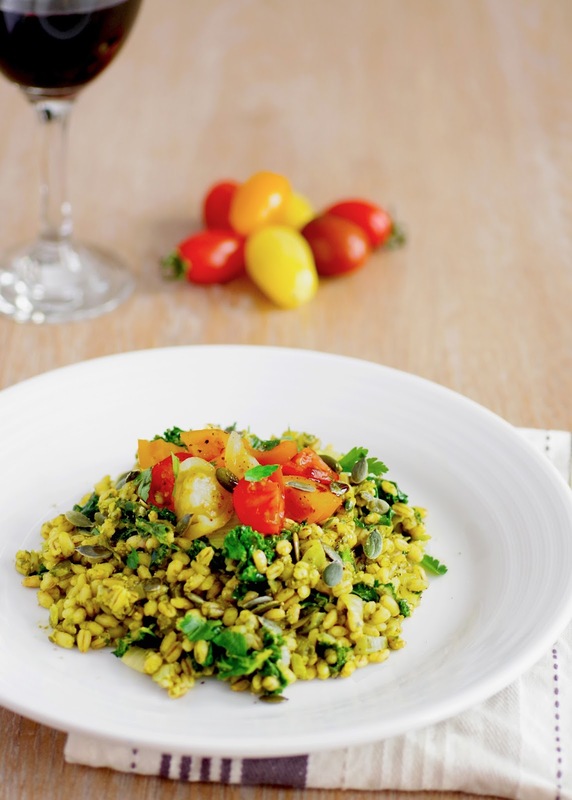 This dish can be eaten hot, like a pearl barley risotto, or cold, as a salad - it's delicious either way and super healthy too! Along with giving this pearl barley dish the most incredible flavours, pumpkin pesto is also a nutritional powerhouse, delivering heart-healthy magnesium, electrolyte potassium for fluid balance, zinc for immune support, B vitamins for the nervous system, iron for energy and even a boost of essential fatty acids, omega 3 and 6s too! 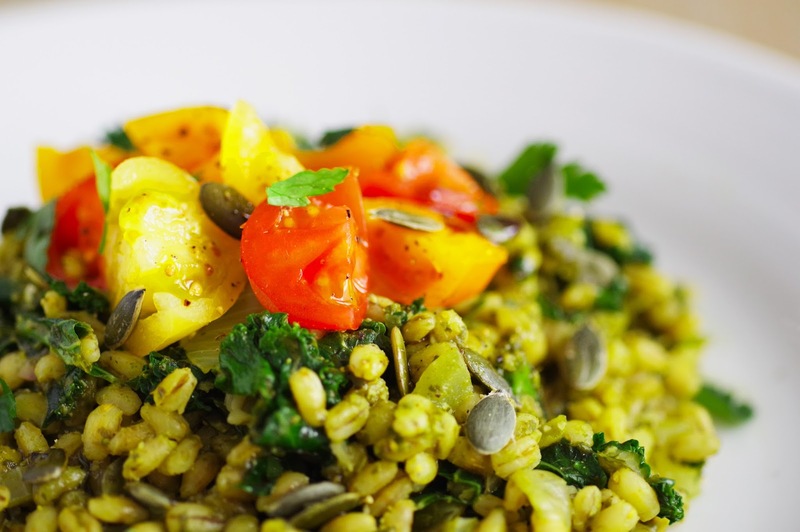 Not to mention the generous amounts of vitamin K and C from the veggies and a healthy dose of protein and fibre from the pearl barley - keeping you well energised and nourished! This dish is ready in around 30 minutes, is super easy, healthy and loaded with flavour - what more could you want? Dice an onion and fry with a splash of olive oil on a medium heat for a few minutes, add the pearl barley, stir through and pour in the water, bring to a low simmer, put the lid on and simmer for 15-20 minutes. Make sure the pan doesn't boil dry. Meanwhile, add all the ingredients for the pesto into a food processor or high-speed blender and blitz until smooth. Remove the lid from the pearl barley, stir in the pesto and cook until all of the water has reduced and the pearl barley is tender. For the last minute of cooking, stir through the kale and then remove from the heat. 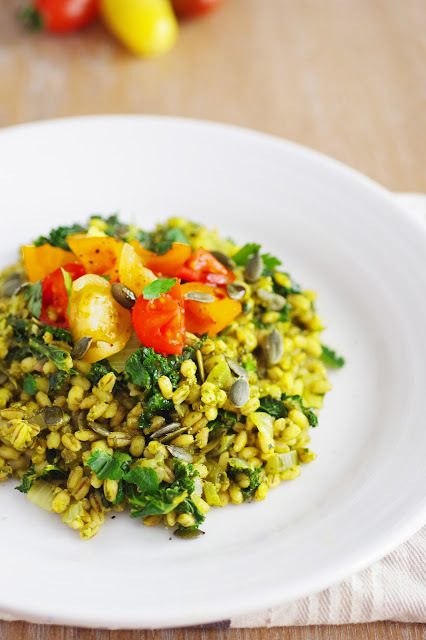 Serve up with fresh heirloom tomatoes and a sprinkling of pumpkin seeds and enjoy!